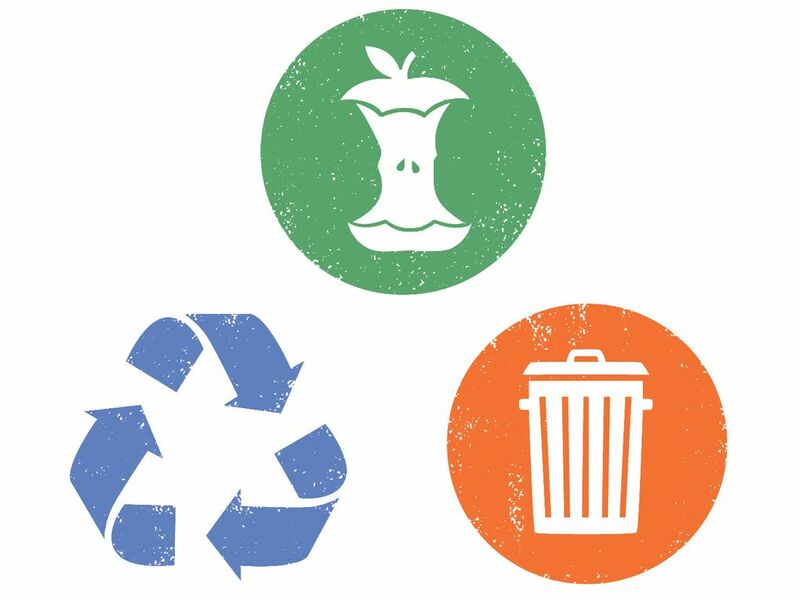 We answer readers’ questions about trash sorting and offer guidelines to help you recycle and compost like a pro. This guide will make you the enviable trash-sorting expert among your peers. With the help of Seattle recycling experts, we provide general guidelines and specific answers to the questions you asked earlier this year. With the city’s mandatory composting rules now in effect, it’s a good time to brush up. A. Hair and fingernail clippings go in the garbage. If your hair is long enough, you can donate it to Locks of Love, but of course most of your locks won’t be. Alternatively (if this doesn’t gross you out), you can ball up your hair and clipped fingernails and put the wad in a tree. Birds will be happy to use it to make their nests. A. It’s better to compost food. Food that goes down the drain does not get composted — it ends up in the sewer, where it can actually harm the water treatment process. It can also clog pipes and attract rats to the sewer. A. Though it’s not pretty, dead animals go in the garbage, as long as they’re lighter than 15 pounds. Animals larger than that should be taken to a veterinary clinic, animal shelter or pet cemetery for disposal. Your other option is to bury the chicken in your yard, but be sure to bury it deep so varmints don’t get to it. Q. I have a parrot that is trained to poop on paper towels. Where does that go? A. Garbage. Paper towels are compostable only if covered with food, not cleaning chemicals or poop. Animal waste, including human waste, can carry disease. The only exception is manure from livestock, which is OK to compost. Q. I collect huge amounts of plastic bags, like the plastic that rolls of paper towels come in, Bubble Wrap and plastic shopping bags. I stuff it all in one big bag, seal it up and put it in my recycling. Is all of this recyclable? Do they sort it further? Dump it all in the garbage? I’m wondering if I have been wasting my time. A. You are wasting your time. Well, not all of it, but some. The only forms of lightweight plastic you can recycle are clean and dry plastic bags (but not produce bags), newspaper bags, dry cleaning bags, shrink wrap and Bubble Wrap (bravo on that one!). Usually, everything else is either dirty or prone to condensation, which messes with the recycling process. But to your credit, you were right to stuff everything into one bag; plastic bags have to be recycled in bunches, not alone. Q. One of my Ikea chairs broke beyond repair. It’s made of solid pine and coated in varnish. I hear that Ikea products are designed to be biodegradable. Would it be OK for me to break it up, remove the screws, and put it in the compost? A. No. “Biodegradable” does not mean compostable. You could put it in the garbage, or you could try to make something out of it. Check out ikeahackers.net for ideas — you might be surprised what people come up with. Q. Glass and plastic containers are recyclable — I get that. But what about peanut butter jars? It takes about 4 gallons of hot water to get all the leftover peanut butter out of them. Do I wash them out and feel bad about all the water I wasted or toss them and feel bad about not recycling? Same question for olive oil jars. A. Recyclables have to be clean, but how clean is clean? In the case of a peanut butter jar, if you have enough peanut butter left to make a sandwich, that’s too much — scrape it out and rinse it. Seattle Public Utilities says the impact on the water supply of rinsing recyclables is negligible, but if you want to conserve water, you can put your peanut butter jar in the dishwasher with your other dishes. Instead of telling you what to do with every single item, we’re giving you general guidelines to help you choose the right bin on the fly. One guideline generally applies to several items. It’s better this way, we promise.